You know what you are talking about. There are plenty of knowledgeable amateur naturalists, Master Naturalists, and citizen scientists, as well as professional scientists, online who can help make identifications. If you do not consider yourself in one of those categories, it may be best to refrain from commenting. That way, there is no need for someone else to correct you down the line. That said, you can be a professional and still be incorrect, but at least you'll be in the ballpark. You have read all of the previous comments! Most redundancy in threads comes from people eager to comment who do not realize the correct answer has already been given. Facebook does not make that easy, because a long thread leads to hidden comments and generates a header that reads something like "view previous [insert random number here] comments." You have something truly worthwhile to add to the conversation. Anecdotal observations can be genuinely helpful, and also create a sense of community in an online group. Post away. Comments like "Burn it with fire!" or "Eew, gross!" only reveal ignorance and intolerance. Use good judgment, and understand when to deploy a filter for your "hostile voice." Do *not* post another image *within* an existing thread. The addition of more images within a thread, unless the images are of the same specimen, by the same person who started the thread, creates great confusion. The internet as a whole is not always the best source of anything, let alone correctly-labeled images, even if the Google search results say so. If you want to post your own images, start a new thread. Include links to resources that back up your answer. There is no such thing as too much information, and most people asking for the identification of an organism know nothing about it. So, providing a link that sheds light on the life cycle, biology, and ecology of the creature is usually received warmly. Learn who the other players are. If you doubt the credentials of someone else making comments, look them up and see whether your (low) opinion has any basis in fact. You might find that the person is a college professor, curator at a museum, author of a book, or otherwise has vast knowledge of the subject at hand. Do NOT argue with others. This is why I just suggested you get to know the other players, and find out who you can trust. Word your different opinion gently ("I think it is this rather than that, because of this characteristic, behavior, etc"). That way you are being respectful, and giving more insight, too. I may or may not have covered everything here, so please comment with your own suggestions, including what I should have omitted. I may well revise this post accordingly. This spring I started writing blog posts for Tender Corporation's After Bite® "Insectlopedia" website. I am actually subcontracted by HFS Communications, and they have been very good to work with. 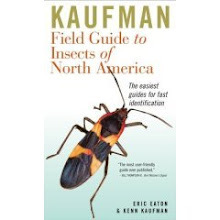 Consequently, I will be routing you to the Insectlopedia blog periodically. It deserves traffic, and will be a good resource if I have anything to say about it. Here is a primer on biting insects and arachnids that I wrote recently. Meanwhile, I just got a big box of Tender Corp products to try, and believe me, with the mosquitoes in the wake of the rains from the wettest May on record for Colorado, I will be trying out the repellents in earnest. 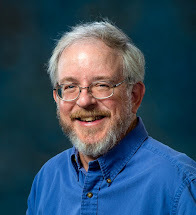 The Myth of "Good Bugs" and "Bad Bugs"
Almost every insect identification request I receive includes the same question: "Is this a good bug or a bad bug?" Ok, another frequent question is "How do I get rid of it (them)?" The concept that any particular species of any organism is inherently good or bad is a symptom of collective ignorance, and I am not sure that the entomological community has done much to counteract that logic. 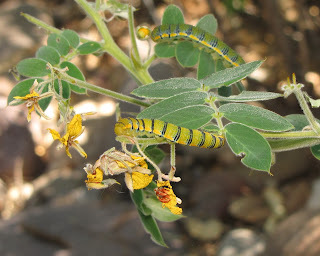 Caterpillars of the Cloudless Sulphur eat Senna. Can you live with that? A good deal of our opinions and beliefs have been biased by large scale agriculture, and the fear-mongering media coverage of economic pests. You also have "organic" advocates who promote "beneficial" species, which they often have for sale in their nurseries and other businesses. The common denominator in those instances is money. Millions, if not billions, of dollars are at stake in products ranging from household and garden pesticides to bug zappers to laboratory-reared lacewings and parasitic wasps. Don't you know that you can't live without any of this stuff? Get behind the sales pitch and the reality is much more subtle and variable. Take the praying mantis, for example. Here in the U.S. you can purchase the egg cases (ootheca) of the European Mantis, Mantis religiosa, for your garden, despite the fact that in most areas of the country you already have one if not several native species already there. 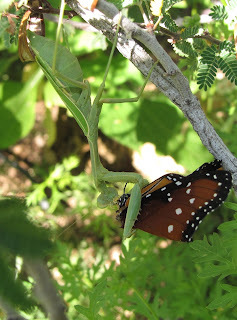 Then there is the idea that mantids are beneficial predators. Mantids are completely indiscriminate hunters. They will eat bees and butterflies as often as grasshoppers and caterpillars. There are even well-documented incidents of larger species killing hummingbirds. Mantids still looking wonderful to you now? 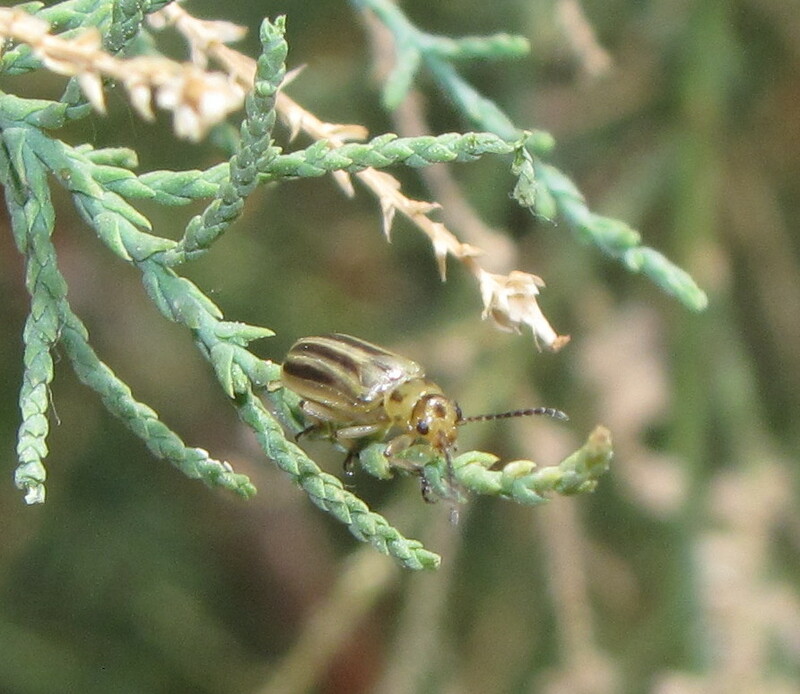 Phytophagous (plant-eating) insects, on the other hand, simply must be pests, right? If so, then how come so many species have been imported from overseas to control noxious weeds? Most herbivorous insects are highly "host specific," meaning they feed on only a few, closely-related plants. Those plants have learned to co-exist with the insects that eat them. The plants produce their own chemical defenses, and even "talk" to other nearby plants to warn them of an impending infestation. Native plants are better able to withstand an onslaught because they are growing in suitable soil and climate. This also allows them to quickly recover from even the most intense defoliation. You can also not equate your garden, yard, or woodlot to a massive farm, orchard, or forest. The reason there are pests at all is because we insist on growing large scale monocultures of various crops (and I would include tree farms in that). What self-respecting European Corn Borer is going to turn up its nose (antennae?) at acres and acres of its host plant? We set the table and then complain about our uninvited guests. The real world of nature does not play favorites, and if you want a healthy planet Earth, let alone a garden, yard, or home, then you have to stop thinking of every species as "good" or "bad." You don't have to like every creature. Personally, I don't like mantids, but I do recognize their place in the grand scheme of things, and appreciate their existence for that reason alone. I am arguably a member of way too many groups on Facebook, but it appears that social media groups are now the place to go if you want an identification of that "thing" crawling across the kitchen floor, eating your tomatoes, biting your child, or otherwise causing consternation or curiosity. Here, then, is how to make a post and get an accurate answer. This primer also applies to any other online outlet for getting identifications. You don't have to be a professional photographer. These days you can snap a quick pic with your smartphone and upload it instantly. It doesn't even have to be perfectly focused. Crop it if you can, so that there is as much detail as possible, before posting it. Choose an appropriate group to post to. So you are pretty sure it is a spider. Find a group that specializes on those arachnids. 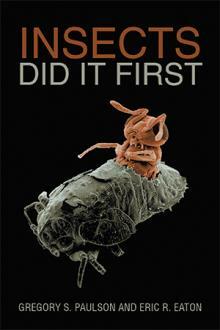 There are also lots of "bugs" groups that encompass just about anything without a backbone. There are garden groups where people often post images of suspected pests, but often it is the blind leading the blind and you may not get anywhere near the truth despite other members' good intentions. I have seen many times someone from another country post an image and everyone responding assumes it is a species from the U.S. It works the other direction, too. Save responding parties time, energy, and embarrassment by posting the location where your image was taken or the creature was seen. Be as specific as you are comfortable with, but at minimum include nation, state or province, and county or district. Use coins or currency, keys, or cigarette lighters in an image to demonstrate scale, it often helps; or estimate, preferably in millimeters. Disregard sarcastic remarks about spiders making off with your cash, stealing your car keys, or setting fires with those lighters. A detailed description in general can also suffice in the absence of an image. Common courtesy goes a long way to endearing you to experts. Say "please" and "thank you." Be understanding that the people responding may be volunteering their time to assist you. Many professional entomologists in fact face reprimands from superiors for "wasting their time" on "trivial matters," despite the fact that job descriptions often cite "public outreach" as a priority. Do not assume the *first* answer is the *right* answer. Many members of various online groups are amateurs themselves, and the learning curve is steep in making identifications. Most real experts are also specialists, so they may not be able to identify every post in a given group. Their expertise may be limited to bees, for example. Wait for several replies, and do a little homework on each answer to see whether it fits or not. Remember that everyone could still be wrong! Do share your "mystery bugs" with us through social media, photo-sharing websites, and other online outlets like Project Noah or i-Naturalist. We enjoy seeing your discoveries, and often enough they are valuable sightings. Take care and good luck! I hate to burst your bubble, but most butterflies are not pollinators. They are eye candy. Butterflies are best described as "flower visitors" that are there seeking nectar, a carbohydrate, to fuel their flight. They could generally care less about pollen. It may actually be a nuisance that builds up on their bodies and has to be groomed off to maintain the insect's keen senses of smell (antennae), and vision (eyes). 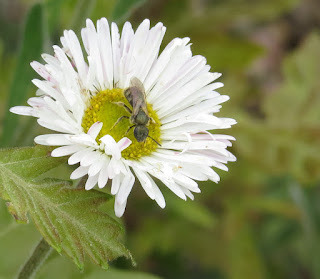 They pollinate by accident, thanks to pollen getting trapped in body hairs. Pollen grains probably clog the proboscis, too, as that "tongue" is a complex assemblage of several tubular and sheath-like mouthparts that actively pump nectar from the flower into the butterfly's digestive tract. 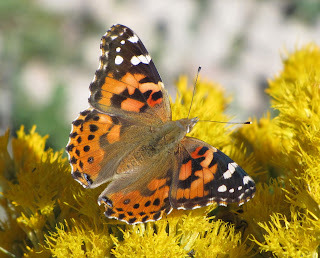 To be fair, there is one class of butterflies that actually eats pollen: The Heliconiinae subfamily of the brush-footed butterflies (family Nymphalidae). These are the "longwings" that are favorites in the tropical butterfly house industry. Longwings fly rather slowly, often at eye level or lower, and have a great diversity in species. There is even strong diversity in color pattern within a single species. They make near perfect display animals in captivity. They also have greater longevity as adults because they have the capacity to ingest protein in the form of pollen. When contemplating planting a "pollinator garden," prime consideration should be given to bees, hummingbirds, moths and flies. Butterflies will be attracted regardless, but the real pollinators need to be your target. Planting native species should take priority over gaudy ornamentals that too often become invasive in the natural landscape, and/or are too demanding in terms of fertilizers, pesticides, and other artificial life-support chemistry. Tolerate "weeds!" One man's weed is another species' wildflower. Wild composites, that is, flowers in the aster family, are greatly preferred by most insects because they can visit more than one flower at one stop, reducing energy expenditures from flying blossom to far-flung blossom; and the flat surface of composites affords them a greater field of vision to watch for approaching predators. Few insects want to literally dive head-first into tubular flowers, though many bees do so all the time, and I have seen sulphur and swallowtail butterflies do so. Tolerate caterpillars! Many people fail to see the link between the butterflies (and colorful moths) they love, and the larvae they loathe. You cannot have one without the other! 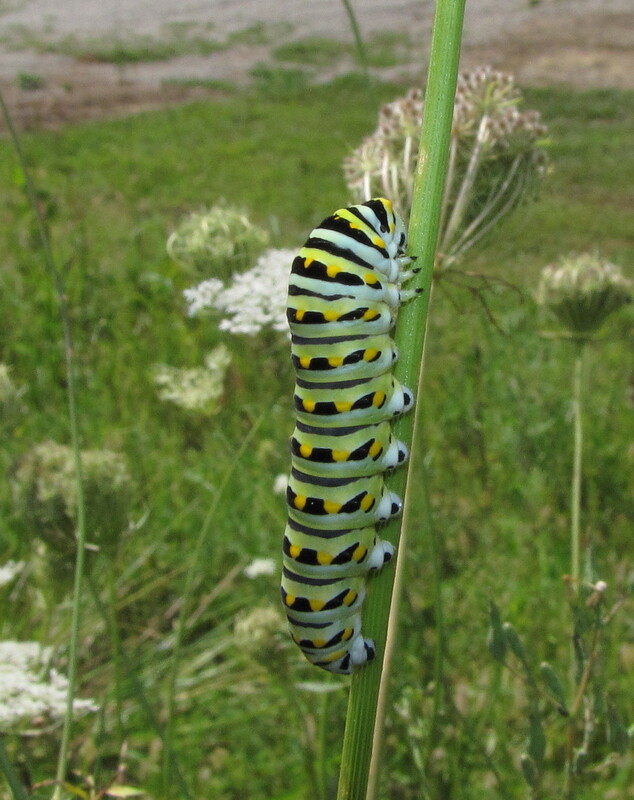 Planting host plants for caterpillars will arguably do more to attract butterflies to your garden than planting nectar-rich flowers. Remember, too, that plants have their own built-in chemical defenses to protect themselves; and even if defoliated, they can recover. A complete garden ecosystem with all its checks and balances in the form of herbivores, predators, parasites, fungi, soil fauna, and other organisms, is far less expensive to maintain than one that is micro-managed with pesticides and herbicides. Save time and money by choosing the right plants initially, and learning from reputable, unbiased sources what insect species are truly harmful and which are ones you can live with, if not encourage. 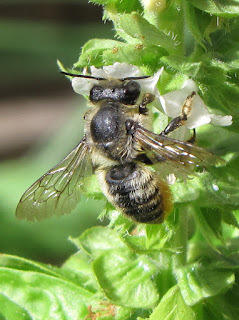 Think native bees. The apiculture (honey bee) industry is a powerful lobby, and has largely convinced the general population that honey bees are the *only* bees. The overwhelming majority of bee species are native, and solitary or semi-social in their habits. Agriculture needs honey bees, no question. Your garden, and wild habitats, do not. 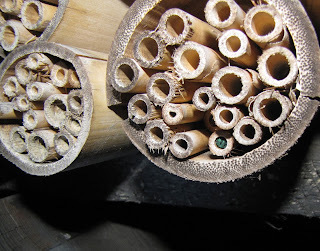 Consider putting up bee boxes for housing our native, solitary bees. Their traditional nesting sites are being plowed under, paved over, and cut down at such a rate that they can use artificial homes. 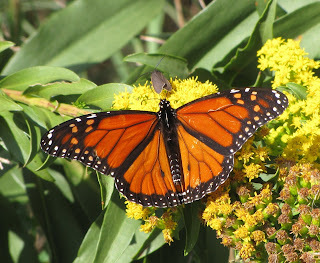 Lastly, I will say this for the Monarch butterfly. 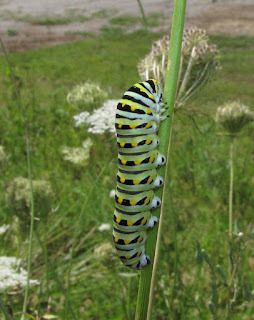 They are large insects, powerful enough to effectively pollinate milkweeds. Milkweeds package their pollen in sticky bags that are not easily dislodged from the flower. You can usually find bees, flies, and other insects that have become mortally stuck to milkweed flowers, unable to extricate themselves. Large wasps, large bees, and large butterflies are among the few insects able to effect the pollination of milkweeds. Learning which insects effectively pollinate which plants is also key to making your own garden or yard a "pollinator paradise."